Even though I was skeptical, I put out my first hummingbird feeder several years ago, after hearing several people say that hummingbirds would actually show up. I had several unused hooks already in place off the deck where I used to have bird feeders. Although the bird feeders brought a variety of birds, which was nice, they also attracted squirrels, that gorged on the seed, and probably attracted other, worse things that I never saw. The last straw was when the cats woke me up in the middle of the night to let me know something was happening in the backyard. I flipped on the floodlight and saw a big old hairy raccoon had climbed up 15 feet onto the deck and was enjoying the birdseed and his friend the opossum was down below catching the seeds that fell. Although the cats were ecstatic, I was less than thrilled, so the birdfeeders were moved to the backyard, near the lake. The hummingbird feeder comes out every year in late March, nestled among hanging baskets containing colorful flowers to make sure hummers will take notice since it’s so high up. The feeder isn’t elegant, but it is bold: a fire-engine red plastic base with little yellow flowers around it and a clear glass top, but the important thing is that the hummers seem to like it. 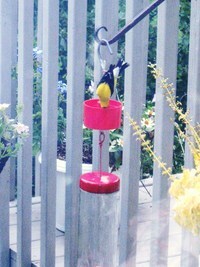 My feeder also has a perch, so I get a great view of these colorful creatures as they drink the nectar. Hummer sightings are usually slow in the spring, but this year, to my delight, the very first day it was out, an emerald green ruby throated hummer visited. 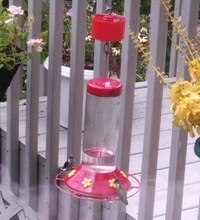 By July and August, though, hummers are at the feeder almost non-stop from morning to evening. I was very surprised to find how territorial they are. It’s not uncommon for one hummer to be drinking at the feeder, another arrives at the same time and they chase each other away, whirling and diving across the yard. Often one arrives and hovers for a while before he lights to drink, just to make sure there’s not another hummer in the area. Today was a first, though: I saw a wasp chase a hummer from the feeder over and over again!! Seeing two on the feeder at the same time is pretty rare, but as you can see in the picture, they are on opposite sides and can't see each other! Although other birds don’t drink nectar, they certainly visit the hummingbird feeder, but it’s to drink water out of the ant trap on top! I see yellow finches, titmice, wrens, chickadees, and sparrows perched on the hook, leaning almost upside down to drink. Sometimes there will be a hummer drinking nectar and a small bird drinking water out of the ant trap at the same time!! What makes it more surprising is that there is a hanging birdbath right next to the feeder. So I have to remember to fill up the ant trap every day so the little birds will visit. After the frenzy of August, it’s always sad to see the little green visitors start to dwindle in September and early October, but I leave the feeder up until the Halloween, just in case there are stragglers around. It signals the changing of the seasons and the slide toward the holidays to put away the bright red feeder and look out to see only an empty hook where such beautiful creatures swarmed only a few weeks earlier. 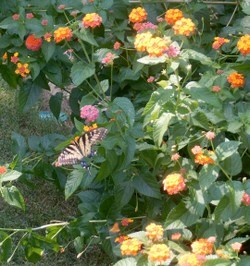 This time of year, my big lantana bushes are just jumping with scores of bees, butterflies, and hummingbirds. Today I saw four eastern tiger swallowtail butterflies light at the same time. Their yellow and black wings slowly opened and closed as they drank the nectar. Black Swallowtails and Monarchs are frequent visitors and hummers slip by for a quick drink. I’ve even seen the hummingbird moth and other smaller butterflies. Lots of times, I just sit at the window watch—the activity never ceases, starting in the morning and continuing until dusk, with the bees, butterflies, and hummingbirds all peacefully sharing the bounty. If you live in a hospitable climate for them, like Georgia and Florida, lantanas produce oceans of beautiful flowers from spring to fall. There are lots of lantana varieties now-- lavender, yellow, red and yellow, creamy yellow and more--all really beautiful. but my very favorite is the "Miss Huff". “Miss Huff” is particularly showy, with each flower a mixture of hot pink, bold yellow, and bright orange!! I planted five in my front yard several years ago and they have proven to be very hardy, coming back every spring. After planting them, I was lucky enough to read that the secret to the return of the “Miss Huff” every spring was not to cut down the stalks in the winter; wait until leaves start appearing from the roots in the spring to remove the old stalks. Now they are huge—each one is at least 5 feet high and wide. Luckily for us in Georgia, they are also drought tolerant. Also, I have never noticed any damage from the deer. It could be because they have a very distinctive, but not unpleasant, smell if you bruise the leaves or stems. Welcome to my Georgia Backyard Nature blog where you can keep up to date on the antics of the fascinating creatures that visit my suburban yard. It’s such great fun watching herons, hawks, songbirds, hummers, woodpeckers, geese, ducks, snakes, chipmunks, squirrels, rabbits, turtles, deer, and an occasional raccoon or opossum. There is even a pair of beavers who have a lodge in the lake and periodically wreak havoc on my landscape. Some of my visitors are entertaining like the squirrel and his unending quest to nab some birdseed (peanuts are his favorite). Some are quite frightening like the hawk swooping down from the sycamore tree on a hapless frog or songbird. Some are true pests like the flocks of geese that lounge on my grass and leave what seems like tons of poop. Some are just fun like the dozen wood ducks that patiently wait for me to pitch some cracked corn off the deck in the mornings. But most are beautiful like the two gentle deer that graze by the lake in the evenings and the colorful songbirds that visit the feeder. A slash of a red in the birch tree or a patch of blue hurtling across the yard, or bold yellow in the serviceberry tree really reminds me how cardinals, bluebirds, and yellow finches brighten the world. • flowering bushes like the lantana, gardenia, Rose of Sharon, abelia, butterfly bushes, and roses. I put out birdfeeders with a variety of seed and scattered birdhouses around. The lake and a couple of birdbaths added the water. It worked--everyone eats at The Backyard Diner!! Although some visitors find things to be tasty treats that were never intended for food, like the deer eating my tulips and roses or the beavers felling a young willow tree, it’s hard to get angry with them!! It’s a year-round adventure!! In the spring, newly hatched ducklings and goslings forage around the bird feeders under the watchful eyes of their devoted parents. Bluebirds scout for the perfect house and the water snakes begin their daily swims to the lake from somewhere in the thick grasses upstream. In summer, when the air is thick and heavy, the geese disappear and the mother deer brings her two fawns to nibble grasses at the water’s edge or munch on ripe peaches. Fall in Georgia brings cooler weather and exceptionally clear days. Yellow, orange, and flame-red trees ring the lake, giving it a festive flair, and sadly, the red-headed woodpeckers and hummers take their leave for warmer places. But you can see the birds that remain covering the hawthorn tree and beautyberry bushes and gorging on the luscious, plump berries. While winter is not that harsh here, my backyard is less hospitable with bare trees, brown lawn, and few insects. The smaller creatures begin their hibernation, Northern waterfowl arrive to winter on the lake, and birds gratefully visit the bird feeders almost non-stop. So welcome Georgia Backyard Nature and join me to keep up to date on the happenings in the animal kingdom of my backyard, as well as learn about these interesting creatures, and the trees, shrubs and flowers that attract them.